Prototype statistics from the Outdoor Recreation Satellite Account (ORSA) released by the U.S. Department of Commerce’s Bureau of Economic Analysis (BEA) show that the outdoor recreation economy accounted for 2.0 percent ($373.7 billion) of current-dollar GDP in 2016. 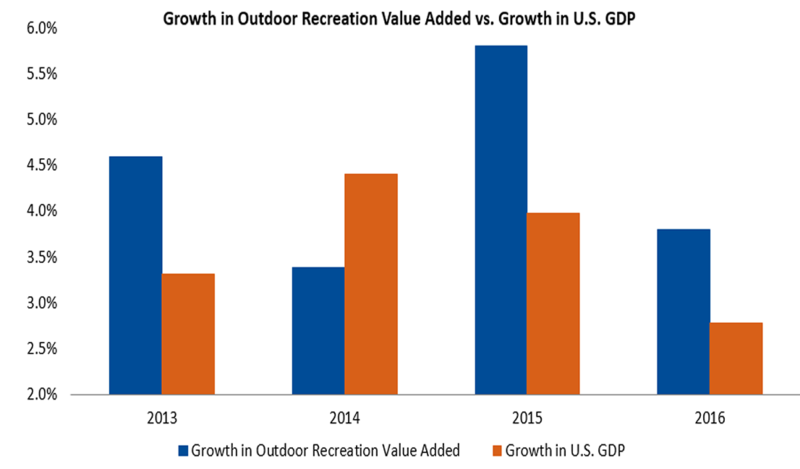 In addition, the outdoor recreation economy grew 3.8 percent in 2016, compared to growth of 2.8 percent in the overall economy. “Businesses need the right data to help them hire, invest and grow. The historical lack of detailed federal data regarding outdoor recreational activities has handicapped both the private and public sectors. The public will no doubt be surprised at the economic importance of this industry as we release prototype statistics measuring the impact of activities like boating, fishing, RVing, hunting, camping, hiking, and more. This release is a milestone for business executives, small-business owners, entrepreneurs, and government officials, who will rely on these detailed data to plan, grow, and gain new insights into this dynamic part of the U.S. economy,” said U.S. Commerce Secretary Wilbur Ross. The new account is the latest addition in a series of satellite accounts complementing BEA’s statistics, including accounts on travel and tourism and arts and cultural production. These accounts do not change BEA’s official statistics, including GDP. They provide greater detail and allow closer analysis of a specific area of the economy by extracting information embedded in the official economic statistics.